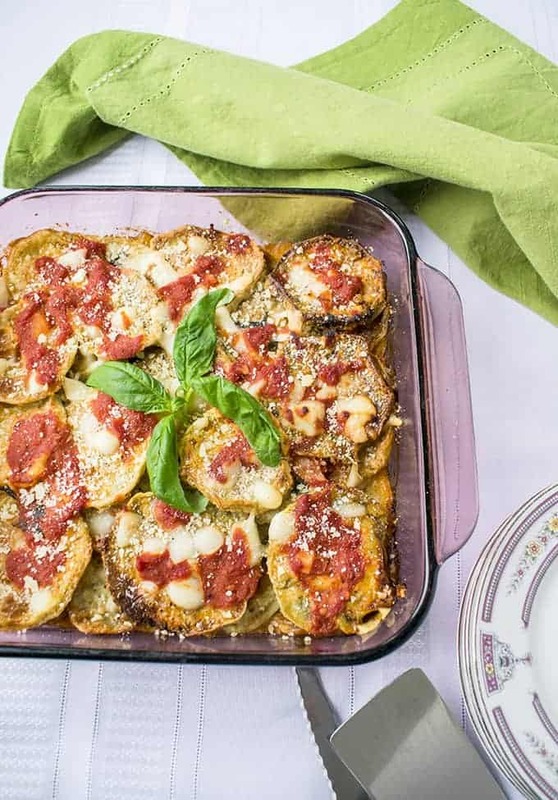 You’ll love this Eggplant Parmigiana Recipe! As in Naples, the eggplants are dipped in flour and egg, but no bread crumbs. Featuring three kinds of cheese, fresh basil and a light tomato sauce. Everybody loves eggplant Parm. Am I right? But, did you know there are different versions of Eggplant Parmigiana in Southern Italy? You’re probably familiar with the style from Sicily and Calabria that features bread crumbs. But in Naples, where eggplant Parmesan likely originated (and where Mom’s from), no bread crumbs are used in this dish. Instead, the sliced eggplants are dipped in flour and egg, then shallow-fried until golden (before being layered with cheese, sauce and basil and getting baked). Skipping the bread crumbs makes for a lighter Eggplant Parmigiana recipe, where the flavor of the vegetable really pops. There’s no tinge of sogginess, either. Don’t get me wrong. I love both versions and have never turned down eggplant Parmesan in my life! I skip the traditional mozzarella, which is very mild tasting. Instead, I use a combo of regular provolone, a touch of sharp provolone, and the requisite Parmesan. That bit of sharp provolone greets your taste buds with an awesome hello on the first bite. I scatter torn, fresh basil leaves (straight from my freezer!) throughout the Eggplant Parmigiana layers. I know it’s winter, but if you see large containers of basil leaves in your grocery store, buy them and place them in a freezer bag within a few days. Add the leaves (they’ll be soggy but still flavorful) to sauces and baked dishes. I make a very quick, plain sauce with just crushed tomatoes, olive oil, garlic powder, basil, salt and pepper. Besides being less work than a sauce with fresh garlic and onions, it’s pleasantly mild and perfectly complements the eggplants. Eggplants coated with just flour and egg (no bread crumbs) will stick to your pan when baked. I tried three different ways, and discovered it’s best to skip foil or a baking rack and just bake them on a greased sheet pan. Still, you’ll need to scrape them with a metal spatula to flip them over, and some of the batter will peel off. But…the beauty of Eggplant Parmigiana is you’re going to make layers covered with sauce and cheese, so your eggplant slices don’t have to look gorgeous. The all-baked version of this recipe tastes delicious, although less crispy. I’ve included instructions for that option in the recipe card notes. Bottom line: Frying the eggplants will be less stressful and can be done quickly in batches (you can even use two pans if you have them.) 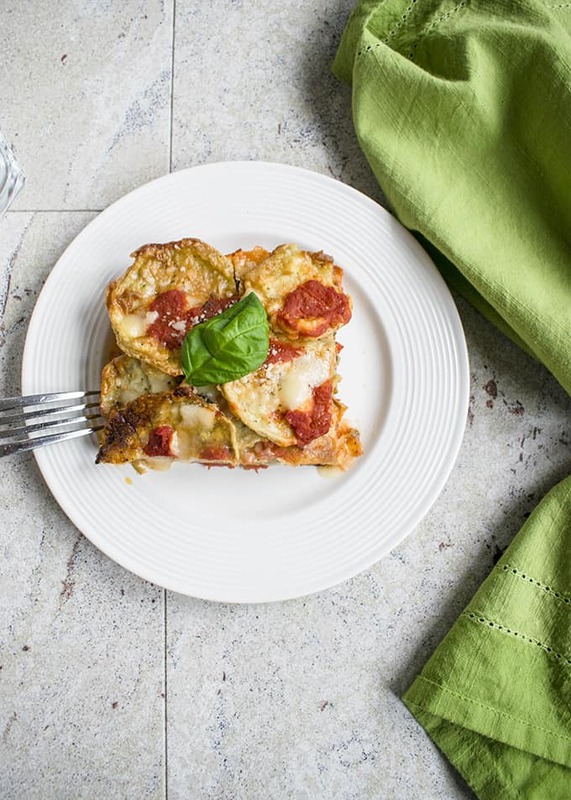 You’ll need to dab the fried slices with paper towels to absorb the oil, but, you’ll get an incredible, slightly crispy texture that works so well juxtaposed with the melted cheese, light tomato sauce and fresh basil. Make sure the eggplants are firm and not bruised. Look for green tops, not brown. Use your eggplants within two days of buying them. Now, go make some Eggplant Parmigiana! P.S. 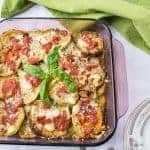 If you love eggplants as much as I do, you’ll want to check out these Parmesan Eggplants with Tomato Sauce (also from Naples, but different than Parmigiana). And, don’t miss Mom’s Caponata (Eggplant Salad), a sweet-and sour Sicilian dish, or Roasted Eggplant Dip (Salate de Vinete), a Romanian appetizer. 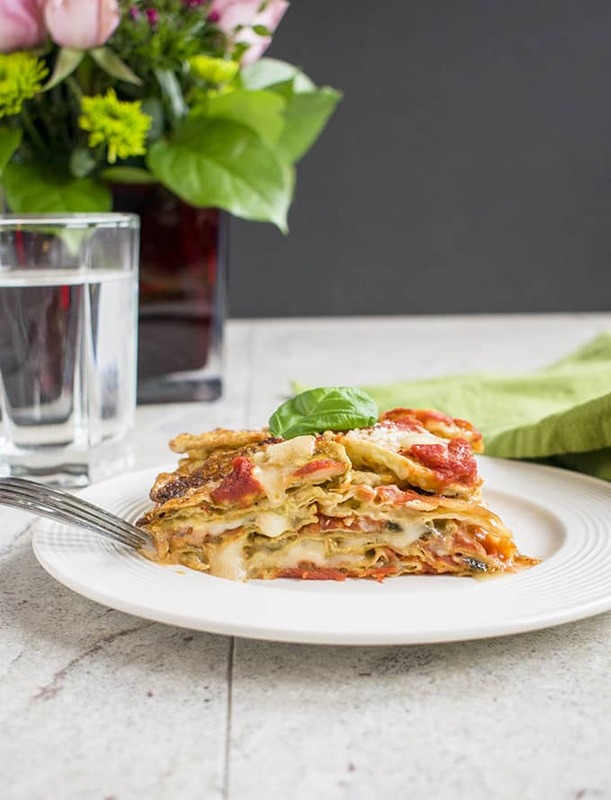 This authentic Eggplant Parmigiana recipe is made as in Naples, without bread crumbs! Read all notes before starting. A little over an hour before you start cooking your eggplants, rinse and pat them dry. Slice off the root and stem ends. Peel the eggplants using a small knife (cut the eggplant in half, stand up each half, and slice off the skin from top to bottom.) Slice the eggplants into rounds 1/4-inch-to-1/3 inch thick. To draw out moisture from the eggplants so they won't be soggy and will have better flavor, place a layer of eggplants in a colander placed over a sheet pan. Sprinkle salt on the eggplants, then add another layer of the slices. Salt those, then weigh the eggplants down with a round baking dish or pot. Let them sit for an hour. While the salted eggplants are resting, make your sauce, if needed. In a medium pot or 12-inch skillet, add your crushed tomatoes, olive oil, seasonings and basil. Stir to combine and heat on medium-high, until it comes to a boil. Lower the heat to a simmer and cook the sauce for 10 minutes, stirring occasionally so it doesn't stick. Turn off the heat when it's done. The sauce can stay at room temperature for up to two hours. After your eggplants have rested for an hour, use paper towels to wipe off the moisture and salt from the slices. If there are lots of seeds, scrape out some of them to prevent bitterness. Add your flour to a gallon-sized resealable plastic bag, if you have one, or else add the flour to a dinner plate. Stir in 1/3 teaspoon pepper and 1/4 teaspoon salt. Add two eggs to a soup dish and beat the eggs with a fork. Use a clean fork to transfer a couple eggplant slices to your beaten eggs. Use another fork designated for the eggs to flip your eggplant slices, coating both sides with the eggs. Transfer the battered eggplants slices to your platter and continue with the rest of your eggplants. As your beaten eggs get thick with flour and are almost gone, rinse out the bowl and add a couple more eggs, as needed. To fry the eggplant slices (see notes if you want to bake them instead), heat your oil in a frying pan over medium-high heat. (You can use two pans, if you wish, to make it go faster.) When the oil is hot, add a single layer of eggplants and cook the first side for 3-4 minutes, until golden brown. Flip the eggplants and cook the second side for two minutes, or until golden brown. Drain the fried eggplants on a baking rack placed over a sheet pan, or on a sheet pan lined with paper towels. Continue frying your eggplants in batches. Preheat your oven to 375 degrees F. Choose either a 9x13 baking pan for two layers of Eggplant Parmigiana, or an 8x8 pan for four layers. To assemble your eggplant parm, cover the bottom of your pan with a layer of sauce. Blot your eggplants with paper towels to absorb the oil. Add a single layer of eggplants. Sprinkle them with pepper. For a 9x13 pan, sprinkle on two tablespoons of Parmesan per layer. For an 8x8 pan, sprinkle on one tablespoon of Parmesan per layer. Dot the eggplants with some sauce. Scatter some torn basil leaves on top. Add a layer of provolone slices, with a little sharp provolone scattered in the gaps. Top the Eggplant Parmigiana with more sauce dotted around, and sprinkle with Parmesan. Bake, uncovered, for 35 minutes, or until it's just getting golden brown on top. Let it rest for five minutes before slicing. Serve with extra sauce, if desired. Store leftover eggplant Parmesan in the refrigerator for up to four days. Store leftover sauce for up to five days in the refrigerator, or freeze it for longer storage. When buying eggplants, choose skinnier ones if possible. They should have fewer seeds. Make sure the eggplants are firm and not bruised. They should have green tops, not brown. If the ones on display look bad, ask a produce employee if there are any more in the back. (He or she can bring out a box and let you pick the ones you want.) Cook the eggplants within two days of purchasing them. You can bake the battered eggplant slices, instead of frying them, but they will stick to the pan, since there are no bread crumbs in this recipe. 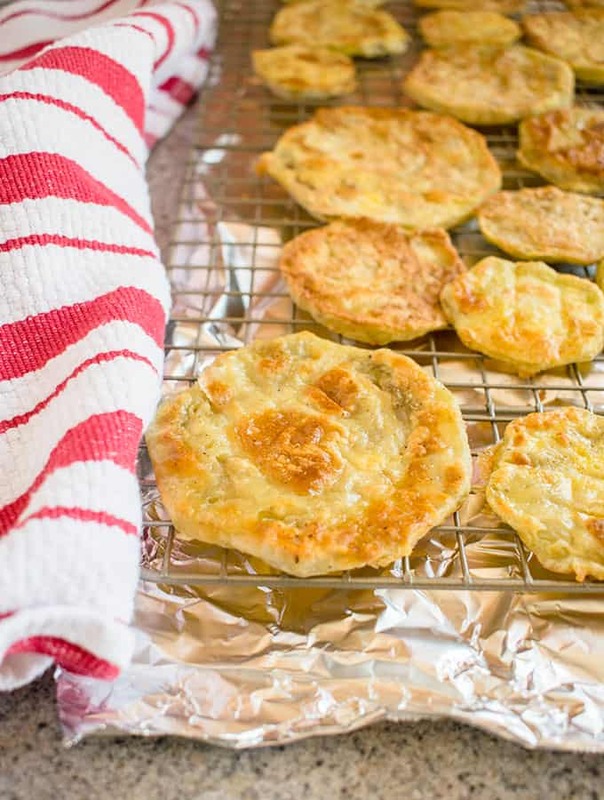 Place the battered slices on a greased baking sheet (don't use foil and don't use a baking rack, because they'll stick more.) Bake at 450 degrees F for 10 minutes on the first side. Use a metal spatula to flip them over. Bake the second side for 5-7 minutes. Assemble as directed in the recipe. Didn’t know this dish was from Naples, or that there were different versions. I really love the sound of this and will try it for sure. This is one of my favorite dishes ever! Love eggplants however they’re made! Eggplants are one of my favorite vegetables. Thanks, Shadi! Yum! I love eggplant parmigiana and yours looks lovely! I do too! Thanks, Jenni. I’m won over –nothing more needs to be said. Eggplant — I love. Make it parmesan and I’m in awe. The dish looks fantastic — it would make my family very happy if I served it. Keeper of a recipe. Thank you, Marisa! My family LOVES this!